are the cream of the crop in the pool industry for many reasons but the complete custom design aspect is a big part of it. All of the options available can be overwhelming for a novice, this is why our team of experts will be by your side guiding you through. 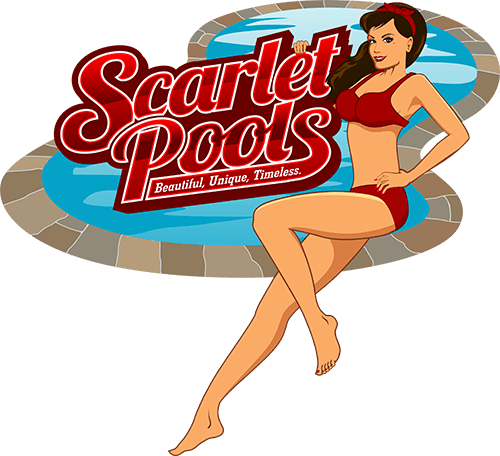 Scarlet pools professional team will help our clients through the process of picking out the shape, positioning, depth and width of the pool of your dreams. Our knowledge comes from many years of concrete pool building and design experience. We think about the little things so that you don’t have to. 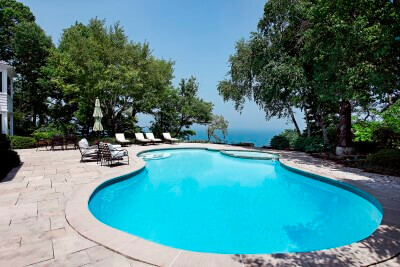 There are important details to consider when deciding on concrete inground pool positioning. Our team is going to have a survey of the land done so that we can make sure that we can decide which part of the land that we are able to dig on.Sometimes there are gas lines, electrical lines, dead bodies, a lot of things we don’t want to be digging up. Once we are able to find out the space that is available for us to build the concrete pool we can decide on positioning that would look best with your deck design along with taking contour of the land, shade, and wind into factor so that the user experience of your pool is at the highest level.Proper planning of positioning also proves to be cost effective when building inground swimming pools, we know this is a detail our customers greatly appreciate at Scarlet Pools. A lot of concrete inground pool designs have classic shapes like the kidney bean, free form (Roman), circle, or the infamous duck and guitar shaped pools. Most of our pool design comes from us choosing a particular style of shape and then adjusting it to fit your desires and the landscape of your home. We also take into factor the aesthetics of your home so that the pool and home combine into one beautiful effect. The shape of the inground swimming pool really dictates many other options available such as lighting or diving boards. Our team will assist you to choose a custom design that fits with the essential features you want for your finished pool. Stairs and retaining walls are an important and essential part of the design process for many home owners. Unless you have the picture perfect backyard that is flat without any dips or slopes, it will be necessary to have some sort of stair or retaining wall added into the design process so that the concrete inground pool can become more cost effective by using less concrete or removing too much soil from your yard. It also becomes a great tool to help create possible custom landscaping options that weren’t possible in your backyard before. The design opportunities for both of these options are vast and exciting. Our team will help to make you aware of all the different custom options available to you during the design process. The number of options available when it comes to concrete pools tiles and finishes is astronomical. We will give our customers the resources and time to find a tile and finish that they enjoy from the most updated database. This is done in the very early stages of the pool development so that our clients have the options to choose from some of the most rare and beautiful options across the globe. There is nothing more impressive than showing up to a pool party where the hosts custom made inground swimming pool is at full glow. The options are truly endless when it comes to impressive features for custom concrete pool designs. Our team of experts will walk you through all of the different options for lighting and water features. Along with providing the knowledge on when and how these options work best with your unique design. All of the above options help to improve the aesthetics of your concrete inground pool, backyard, and home. There are a lot of other options out there to take your pool experience to the next level. From poolside bars with stools, basketball hoops, diving boards, grottoes, barbecues, and waterfalls. Scarlet Pools Saint Louis is here to help you transform your backyard into the ultimate recreational experience of your dreams.